Nintendo are putting out a decent number of titles in North America with the end of the year rapidly approaching, with a nice mix of new and catch-up titles on offer. Todays VC and WiiWare offerings mean that there's now 500 titles to choose from if you're looking for downloadable games on the Wii in North America! Eco Shooter: Plant 530 (1000pts - Nintendo) -- We gave our thoughts on this title when it first appeared on the Japanese WiiWare service last month. It's a rail-shooter with alien-animated tin rubbish as the enemy; we'll let you know if should should strap in for some recycling action or leave it for the dustman. TV Show King 2 (800pts - Gameloft) -- The sequel to Gameloft's popular TV quiz show, this one is a couple hundred points cheaper than the first instalment. We'll let you know if you should tape it or change the channel! Pallurikio (1000pts - Playstos) -- We thought this was a pretty average, if competent platformer. Now folk in North America get the chance to try it themselves! Happy Holidays: Christmas (500pts - 505 Games) -- It's terribly unlikely that the publisher or developer have made any changes to make this application any less of a waste of time than we thought it was when it was released in Europe a couple of weeks ago. Super Smash Bros. (1000pts N64 - Nintendo) -- There have been people clamouring for this title on the Virtual Console since N64 support was first announced and now gamers in North America finally have a chance to play it themselves. In case you're unsure about the hype you can always check out Drake's review of the game from wayyyy back when it was released in Europe! 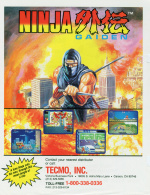 Ninja Gaiden (600pts Arcade - Tecmo) -- North America is also the last to get this arcade classic from Tecmo, but don't feel bad because it's 200pts cheaper than the Japanese release! Again, you can check out our fantastic review before deciding to part with your hard-earned points. UNO (800pts - Gameloft) -- The classic card game finally comes to North America on the DSi (can the WiiWare version be far behind?). James thought it was pretty good so if you like online card games you might want give it a try. 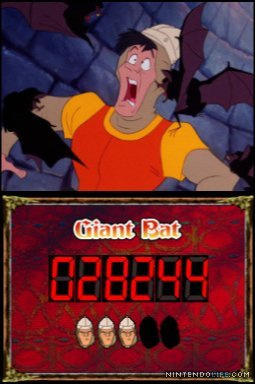 Dragon's Lair (800pts - Digital Leisure, Inc.) -- The original Laserdisc game comes to the DSi! We originally thought this was going to be a full retail cart release, so it will be interesting to see how well it does in download form. Look for our review soon! Hot and Cold: A 3D Hidden Object Adventure (800pts - Majesco) -- Finding hidden objects is quite a popular passtime in the world of online flash games; we'll let you know how compelling an offering it makes on DSiWare. High Stakes: Texas Hold‘Em (500pts - Hudson) -- The current poker favourite comes to DSiWare. It boasts wireless support complete with voice; we'll let you know if Hudson's dealt the definitive Texas Hold'em experience! myNotebook: Green (200pts - Nnooo) -- Everyone's favourite application; now available in green! Deck the halls with downloadable fun this week as Nintendo offers 11 new games to engage and entertain everyone in the household. Among this week’s highlights is the Virtual Console™ debut of the original Super Smash Bros.™ game, bringing the total of downloadable games for the WiiWare™ and Virtual Console services to a fabulous 500 and featuring a host of beloved characters from across the Nintendo universe. 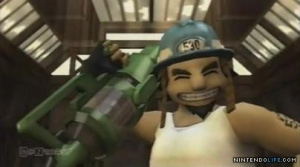 New WiiWare offerings include the Earth-conscious action game Eco Shooter: Plant 530™ and a sequel to the quiz-lovers’ favorite TV Show King. For Nintendo DSiWare™ fans, fresh arrivals include hand-held versions of the card-table classic UNO™ and the pioneering arcade game Dragon’s Lair®. For rollicking multiplayer fun, mellow single-player diversions and everything in-between, Nintendo’s got you covered for the holidays and beyond. Description: Choose from an all-star cast of Nintendo characters in a frantic melee to prove who will be the ultimate brawler. Utilize the easy-to-learn but hard-to-master controls and battle it out in the single-player mode, earning point bonuses and unlocking hidden characters along the way. Enter VS Mode to take on up to three other players simultaneously. Inflict damage using each character’s unique set of special moves, familiar items and power-ups, eventually winning by knocking your opponents off the screen in one of the interactive stages, each with a Nintendo theme. Need a moment to catch your breath? Polish your skills in Training Mode or destroy targets in Bonus Stages specific to each character. Are you ready to test your mettle against all comers, including the powerful Master Hand? Description: Take control of a ninja, master of the Five Ninja Fighting Arts of assassination passed down since the chaotic times of feudal Japan, and enter “Jungle,” a terrifying American city, to crush waves of foes who are part of an assassination syndicate. Use three buttons to execute exciting moves like the Flying Neck Throw, the Hang Kick and the Triple Blow Combination. Each stage is based around popular Western misconceptions about ninja and Japan, making the game world a fantastic mix of ninja and American pop culture. Game settings such as the starting number of player characters and the difficulty level can also be adjusted. Description: Earth’s empty cans have been brought to life by the Cannoids, an alien race determined to destroy the planet. Only Mack, a technician from the recycling facility Plant 530, stands in their way as Earth’s last line of defense. Step into Mack’s shoes in this guided first-person shooter as he takes on the invading aliens with only his trusty recycle cannon and a can-do attitude. Blast and vacuum (yes, vacuum) your way to victory, keeping in mind that every shot counts. Your ammo also doubles as your health, and every enemy you destroy leaves behind Can Energy that you can vacuum up and use as ammo. Uncomplicated controls (including optional use of the Wii Zapper™ accessory) give everyone the chance to save the planet, while advanced tactics like consecutive hit combos and the tough Challenge mode give even the best players a run for their money. Are you ready to step up and put a dent in their cans? Description: TV Show King is back for a second round. There are 8,000 questions sorted into 12 categories on the program, including general knowledge, sports, movies, music and more. And that’s without counting the questions that you can create yourself. Here’s everything you need to compete with your friends, or with players all over the world thanks to Nintendo® Wi-Fi Connection. Description: Jump and roll with Pallurikio, a fast-paced action platformer that’s easy to pick up yet challenging to master. While playing a mysterious board game he found with his friends, Rusty is sucked into a dimensional vortex and finds himself in a mystical and wondrous world where he assumes the aspect of the round and bouncing Pallurikio. Using the Wii Remote™ controller, make Pallurikio jump and roll and help him find his way through more than 50 enticing levels while surviving all kinds of pitfalls and trickeries in Bakumbala Jungle, the far reaches of Palluro Prime and many other weird settings. Featuring physics simulation, Time Attack mode, collectible cards and space rockets to boot, Pallurikio is a game you won’t want to miss. Description: Planning a Christmas party and want to grab guests’ attention? Or want to send greeting cards without the hassle of licking stamps? Here’s the solution: Create and send fun Christmas cards with this unique WiiWare application. Happy Holidays Christmas lets you make fun Christmas-themed e-cards and send them straight to friends’ Wii™ consoles. Add a tree and decorations; choose frames, stickers and music; then write a message to friends you’ve registered in your Wii Address Book. It might not snow this Christmas, but with this fun new software your holiday is guaranteed to be a happy one. Description: Get ready to call out “UNO!” on your Nintendo DSi™ system. The world-famous card game has been faithfully reproduced for the Nintendo DSi system and features exciting new rules. With a multiplayer mode that can be accessed by local wireless play or with broadband Internet access and Nintendo Wi-Fi Connection, playing UNO has never been so fun and easy, so be the first to get rid of all your cards. Description: You play the heroic Dirk the Daring, a valiant knight on a quest to rescue the fair princess from the clutches of an evil dragon. Control the actions of the daring adventurer and find your way through the castle of a dark wizard who has enchanted it with treacherous monsters and obstacles. In the mysterious caverns below the castle, your odyssey continues against the awesome forces that oppose your journey to the dragon’s lair. Dragon’s Lair is a fully animated classic arcade game from legendary animator Don Bluth. Description: You’re getting warm...warmer...hot! You’ve found Hot and Cold: A 3D Hidden Object Adventure, the new game that puts you on the job of finding people’s missing stuff. A voice in your head tells you whether you’re Hot or Cold when searching for things. Investigate cases all over town using your unique ability, and discover the secret behind the mysterious voice in your head. Throw objects out of your way, maneuver your way through a 3-D world, follow your Hot and Cold meter and more in this unparalleled hidden-object adventure. Description: Hudson proudly presents the definitive Texas Hold‘Em game for Nintendo DSiWare with High Stakes Texas Hold‘Em. High Stakes allows players of any level to enjoy Texas Hold‘Em game play. The popular No-Limit rule set used in many tournaments is included, so anyone can play with the big boys. With the added functionality of DS Wireless Communications, players can compete with others and test their skills. It’s the core Texas Hold‘Em experience on your Nintendo DSi system – anytime, anywhere. Yeah!!!! Smash BROS.!!! Uno, cool!!! Here we go! But Happy Holidays?!? And why is Uno 800?!? Nothing for me today, but it's nice to see another voluminous update. I had planned on getting UNO for DSiWare as I've got 500 points, but I'm not adding points just to get it. Disappointing that it was bumped up to 800 in NA. For the next few hours, America gets to enjoy having more WiiWare games than Japan. I'm sure we'll bounce ahead again since they don't update next week. While I am very happy with SSB coming out today, it's terrible that they held this one back as long as they did just to hit a "milestone." Europe and Japan don't do that ridiculous milestone stuff NOA! Why do you! It's pointless and only serves to give us the games we want with a ridiculous amount of space in between. What stupid milestone will Nintendo come up with for Pilotwings? Better hope they think of something or else we'll be waiting until the 350th VC game for it! Finally we have Smash. I was hoping Pilotwings was coming today with it but at least now we are completely caught up to Europe (plus one) on Arcade titles. On the WiiWare front I'm surprised not to see Cave Story and that should concern us all. With only one update left in 09 and Cave Story's absence on the Q1 release list, I think we're only a week away from confirming this game as vaporware. It's a shame too because this was the best WiiWare game to have been announced. I guess we'll see next week, huh? This is an very good update, especially for DSiWare. Virtual Console is pleasant too. Now it's time for me to get me some Wii Point Card. But of course, I have to watch the PC Engine version of Street Fighter II: Champion Edition for an hour as I promised since Pilotwings hasn't come out yet. @Rapadash6: If the game doesn't come this week, they probably delayed it. @bboy2970: Be glad we got the game at all. They could have said "You're not getting it" to us and that would be it. Also, Super Mario Kart is not an milestone game and neither will be Pilotwings. Still no Castelvania Rebirth or Cave Story? You're killin' me, Nintendo. You're killin' me. Nice update! Nothing for me (though, Eco-shooter sounds interesting, waiting for the review), but I just got the perfect Xmas present to gift to my best friend, so YAY Smash! Thank you Nintendo for releasing it before Christmas. Cave Story is still supposedly in development and Reflect Missile is confirmed for January 4. I imagine Castlevania Rebirth is good and ready though so that can't be too far off. Guess we will be Falcon Punching on Xmas day over here in Europe. Wonder if we will ever get "Excite Bike World Rally"? Would also be nice to get "Castlevania Rebirth" and "Cave Story", as mentioned above. Decent downloads the last few weeks, (Blaster Master) but still waiting on Pro-Wrestling its been almost a year since it was confirmed and so far nothing!! Does anyone have any info on the company Rare? i heard Microsoft has purchased them for there download service but i also heard they have not ruled out the VC on the Wii. Pilotwings is coming next week by the way. At least Smash Bros. is out before the holidays and it's one less game for people to whine about. It's disappointing UNO and Dragon's Lair costs a little bit higher than expected. After all, UNO for the DSi was priced at 500 Nintendo Points in other territories while Dragon's Lair is $5 over at the iTunes App Store. I'm interested to hear more impressions or reviews about Eco Shooter: Plant 530. I love Intelligent Systems' work so I'll be keeping a close eye on this to see whether it's a keeper or not. Here's hoping Pilotwings, Castlevania Rebirth, or Cave Story will show up on the last Nintendo Download update for 2009.
photo fighter X should come next week. Pretty good update, although nothing for me. Also, typo: "we'll let you know if should should strap in "
Smash is just as good as I remember. Nobody's changing my mind on that. Hooray for SSB! I'll probably be picking it up around Christmas if I get another Wii Points card. Great update. Gameloft just had to up uno to 800 points in america. Looks like I won't be getting that anymore. @ Dicesukeinuzuka, Photo Fighter isn't coming to US till atleast 2010. Yay for super smash bros! "thinking about Dragon's Lair but will probably wait for the review to see how the port turned out...."
I'm happy to say Digital Leisure has done it. The Dragon's Lair port has turned out very well. That's good to hear. It's a unique and fun game, I was just cautious on how they would be condensing it to fit into DSiWare. To anyone complaining that there are no good games this week I suggest you download Blaster Master now! I hope can shooter or eco friendly whatever it's called gets a good review! Good update. I was waiting for UNO on DSiWare too... but the price is totally unjustified. It's a shame. I have given up hope on Cave Story. 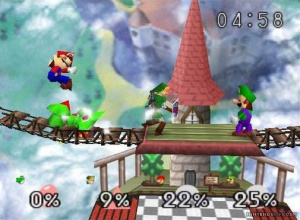 Downloaded Super Smash bros 64 and now Im waiting for Uno wiiware. We got Happy Holidays: Christmas so does this mean Happy Holidays: Halloween next week? "That's good to hear. It's a unique and fun game, I was just cautious on how they would be condensing it to fit into DSiWare." As was I, there is a slight bit of graininess to the graphics and you have to get used to playing on a portable screen but other than that its the Dragon's Lair you know and love from the arcades and it has 2 modes of play and a difficulty selection. Happy B-day to me. I get Smash Bros. today, and last week FFVIII finally came as well on the PSN!! SSB is hard compared to Melee and Brawl. Luigi is the hardest to unlock! It took me a few tries just to unlock Jigglypuff! It's definitely worth it. Now that SSB is out i can get other titles that i have not picked up yet like Sonic Chaos and Mario Bros the arcade game where there is no bowser lol.But i did buy SSB already too. Edit i got Jiggypuff in 1 try.It took me 2 to get Captain Falcon tho.When i played this on the N64 i forgot how i unlocked Luigi but i was never able to unlock Ness and now i can try to get Ness. Super Smash Bros. will be downloaded someday, for nostalgic purposes. The rest...well, whatev', Sooper Smash Bros.
Hey come on, smash bros. may not be as complete as the newest ones but is stilll very fun to play. I may download it to complete the trilogy. Eco Shooter and TV Show King 2? Dragon's Lair? I hate you guys. Your updates have been banging lately. FINALLY SSB has arrived to the NA VC! Guess what? I GOT IT!!! Smashing Update! Get it? Smashing? Woohoo! I'll download Super Smash Bros. and TV Show King 2 tonight. I had no idea TV Show King 2 was going to have online play. That new feature makes it a must download for me. can't believe some kids have the nerve to complain today about the stupid SSB game coming out 'too late' now that you finally got it. Let it go , already, you've got it now. geez. I'll probably download Super Smash Bros. when I have the money. Not particularly interested in anything else here, though. Okay, I'm glad they finally released Super Smash Bros., but c'mon! Not one other game of value?? Not ONE?! This was the freakin' holiday update, and all they gave us was one good game buried under a mountain of coal. Not cool. I mean, just one other good game woulda been nice...since, well, I already got Super Smash Bros. on my N64(which I'll play in celebration of the VC release), so I pretty much got nothing here. Thank G-d XBLA had one of its best games on sale this week - at least I get one Xmas download game this year(although I'm very curious to see what PSN'll be doing this holiday season). I dont see the point in getting the original Super Smash Bros when clearly SSB Melee and Brawl are azillion times better. But then again, it's all about the Nostalgia right? I never really had any with this game and after playing it again a few years ago it doesn't play or hold up as well as it did back in the day. but the same goes for most N64 games...nintendo's weakest system overall if you ask me. the Nes(especially), Snes and Wii on the other hand are GOLDEN. Super Smash Bros.=best Nintendo update yet. Crap update to me. At least we finally got that dated fighting game everyone's been clamoring for. Personally, I'm not thrilled with this week. SSB was fantastic in 1999 but it hasn't aged well at all. It was a fan-service game that became a surprise hit and it shows. Especially when you compare it to Melee and Brawl, which are actually detailed and well-made titles. SSB was fun but not quality. Though, I suppose it's still fitting as a milestone release, as it headed up one of Nintendo's most memorable franchises. At least people will shut up about it now. By the way, where the heck is Earthbound? The Nintendo Week aid that you can get Pilotwings for 800 Wii Points. So I thought that it was gonna be on here plus SSB, so I thought it would be one of the most awesome updates ever. But Shinobi came out instead, but it isn't necessarily a bad thing. I thought everyone already was told that "Earthbound" isn't coming ever. It not being on the Japanese virtual console even is a big tip-off. Still no Cave Story. Forget about it, I have better things to spend my points on rather than waiting. @Tsuchinoko: The situation's still full of too many apparently nonsensical things for some of us to be content with that "answer." Technically, Nintendo never said that, so...there's always hope! Can care less about Smash Bros. as I've made that aware for a long time now. Nothing this week but I'm not complaining with Blaster Master and Spirit Tracks to keep me busy. Good update for me today... gonna go and grab me the Super Smash Bros, Uno and Ninja Gaiden! They were waiting to release smash for awhile now. now I can play all three smash games on the same console!!! Yes, finally! I've been waiting for SSB since Europe got it. About freaking time it was released in North America. I guess we all know which game is coming next week (Pilotwings), not that I care about it anyway, I got SSB so I'm happy. i like the first for reunions, i hope this get more activities. FINALLY SMASH BROS IS HERE I AM DEFINITELY GETTING ME SOME WII POINTS!!! !